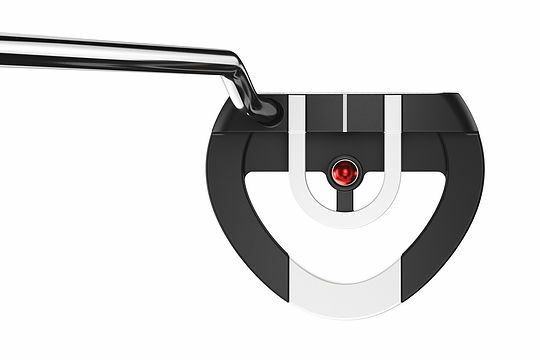 Odyssey has announced the launch of the Red Ball Putter, a unique game-enhancing design that revolutionises the way all golfers align their putter on the green. This new face-balanced, high MOI mallet design is all about getting golfers into the correct posture over the ball before making a putting stroke, and uses a distinct ‘Red Ball’ located under a Scope within the head to perfectly position the face at address. By placing the head so the Red Ball can be seen exactly in the middle of the Scope from above, golfers can instantly see that they are giving themselves the best possible conditions to deliver a repeatable stroke to hole more putts. They can also adjust their position, if the ball is located off-centre to the Scope, to dial in a consistent set-up, every time. To make this new technology even more effective, Odyssey has also incorporated its proven Versa high-contrast alignment technology into the design, and added the company’s legendary White Hot RX face insert to provide enhanced sound, feel and a premium roll. Sean Toulon, General Manager of Odyssey Golf, said: “Odyssey has a rich history of creating ground-breaking technologies – transformational inserts, iconic head shapes and alignment aids like Versa. Our global brand dominance is now further strengthened with the introduction of Red Ball. Available in right handed models, with a DFX grip as standard, in lengths 34″ and 35″ and left handed in 35”. Red Ball Putters will be in Australian and New Zealand stores from August 3rd 2018 priced at AUD $259.99/NZD $319.99. PGA Tour: An easy way to make a million?